If you have undertaken a renovation, known anyone who has, or have ever watched just about any show on HGTV, you are likely chuckling to yourself at our naiveté. We are currently one year, three contractors, countless personal hours, and a great deal more money than we had planned to spend into our project. The other night, as I stood admiring the nearly finished work, I had a moment of gratitude for our current contractor, who came to us with a wealth of expertise, patience, and foresight. He saved the day, our house, our finances, and possibly our marriage. The space is strewn with his tools: bags and boxes of specialized hardware, pieces tiny and large, cutters and sweepers and sanders, all imbued with a special purpose. Building a strong writing workshop is similar to building a house. Doing it successfully takes expertise, patience, foresight, flexibility, and, of course, the right tools. Having an arsenal of resources to draw upon, both in minilessons and in conferences and small groups, is paramount when aiming to expertly and efficiently meet the needs of a range of writers. Just like in writing where organization and development are crucial, when putting together a teaching toolkit, it is essential to consider organization of materials and which resources to include. However you decide to store your teaching toolkit, digitally or in a good, old-fashioned binder, here are some tips for its organization and development. Organize your tools by genre, not necessarily by unit. Most writing units fall into one of the three writing genre emphasized by the Common Core Standards: opinion, informational, and narrative. 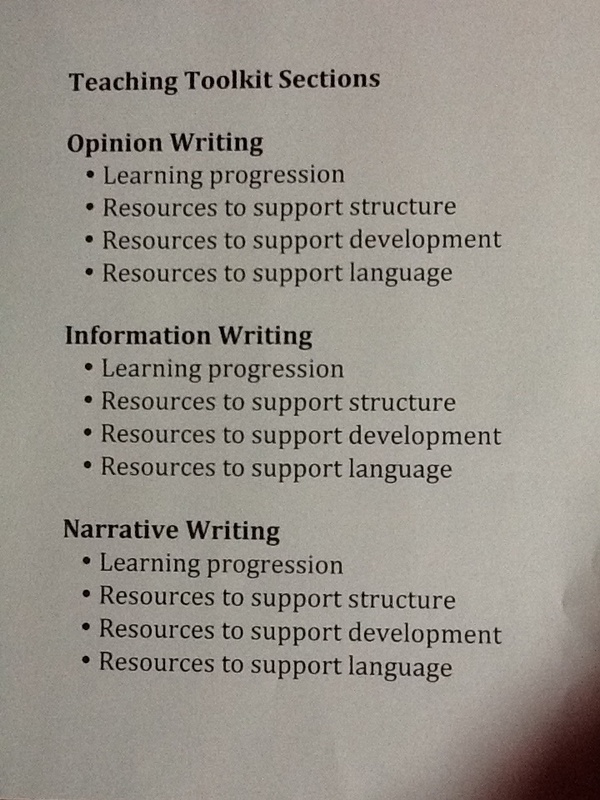 Although we give units within these categories different names (Personal Narrative, Realistic Fiction, Fantasy are all narrative units, for example), the skills that students are working on are similar. Begin each section of your toolkit with the learning progression or checklist you will use to study students’ work. As John Hattie posits in Visible Learning, his meta-study of structures that lead to student achievement, end goals must be clearly articulated for students right from the start. There are many versions of writing checklists, rubrics, and learning progressions available. Many of them, such as the checklists that are part of the new series Units of Study in Opinion, Information, and Narrative Writing by Lucy Calkins and colleagues, contain categories such as structure (how the writing is organized), development (elaboration and craft techniques), and language (mechanics, spelling, word choice). Having a learning progression at the ready supports teaching on the fly, reminding us what are the essential larger goals and what are the smaller steps students need to take to reach them. Consider categories of goals as a way to organize your tools. In this way, you can easily find resources that match a student or group’s most pressing needs. To be most effective, the categories of goals should match the categories of your learning progressions. 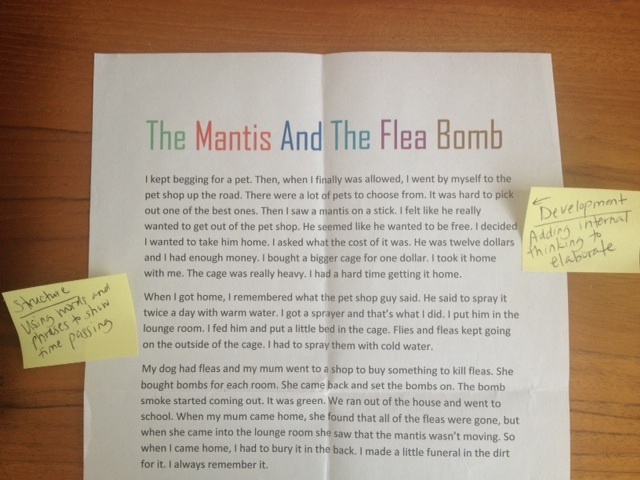 Annotated student writing. There is much value in mining the work in your own classroom. You can also use pieces from previous years or from other classrooms. The Teachers College Reading and Writing Project posts samples of student work on their website. To prepare these pieces, make notes or place post-its on parts that demonstrate a particular technique, skill, or strategy. Annotated teacher writing. Lucy Calkins and colleagues emphasize that teacher writing should be about a level above what students are able to do on their own, not so fancy that students can’t approximate it. Another tip is to create a few versions of a piece with which are students are familiar at different levels. This way, you can choose a version that best matches a writer without having to spend valuable time explaining what the writing is about. The Writing Pathways book in the new Units of Study series has examples of this kind of writing. Student-facing checklists. Whatever the learning progression or rubric you choose to use, student-friendly versions are a great toolkit addition. Since giving students entire checklists could be overwhelming, consider cutting them up so that you can give students only the part of the checklist that is relevant to the conference or mininlesson. Mini-versions of classroom charts. Some students need to have visuals at their fingertips and in their notebooks or folders to use at home and school. Take photographs of your most-used charts, and print small versions to have at the ready. Graphics that represent strategies and techniques. One teaching method that is helpful in conferring is “explain and give an example”. Simple graphic representations of strategies can help so much with the “explain” part of this method. 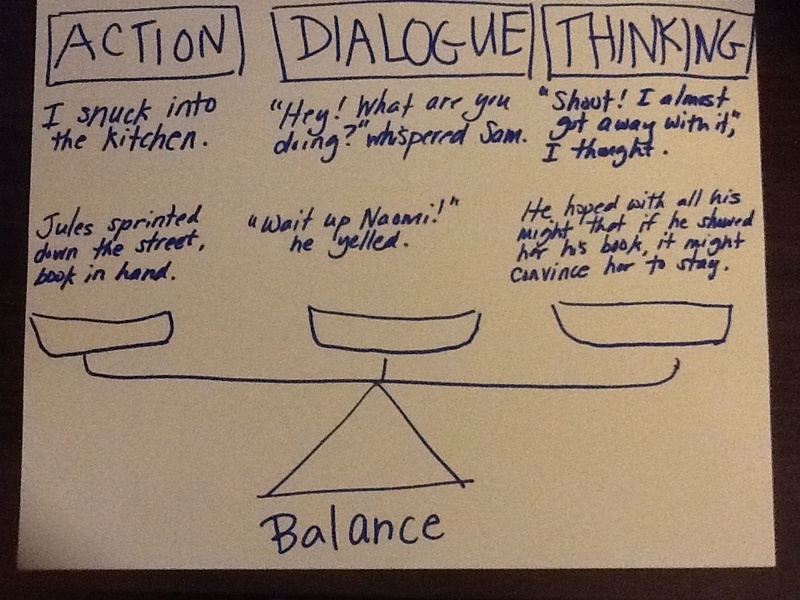 The image below shows one such graphic designed to support elaboration in narrative writing. Mentor Texts. No discussion of toolkits would be complete without a mention of mentor texts. You might include typed up versions of picture books with which your students are familiar or photocopies of a few pages that demonstrate particular techniques. Certainly, my contractor did not build his arsenal of tools overnight. It takes time to collect, develop, and hone the tools that make an effective teaching toolkit. Also, I am certain that my contractor continually adds to his tool collection as needs arise. So too must we add to toolkits with each new group of writers. Best of luck and happy toolkit making! Anna Gratz Cockerille is a staff developer, literacy coach, and writer based in New York City. She has worked as a literacy coach and teacher in schools across New York and overseas. Anna has been a staff developer for the Teachers College Reading and Writing Project at Columbia University and an adjunct instructor for the Literacy Specialist Program at Teachers College. She recently co-wrote Bringing History to Life with Lucy Calkins, part of the recently released series Units of Study for Opinion, Information, and Narrative Writing. She can be found blogging at AnnaGCockerille.wordpress.com and tweeting @AnnaGCockerille. Great post! As a first year teacher, I have struggled with even know where to begin with writing. The toolkit is a really helpful organizational structure that will help my students succeed in writing and help me succeed in teaching them. I love all the charts and pictures, I think my students will benefit a lot from these visuals. Thanks for the tips, Anna! Thanks Abby! I totally agree about the benefit of visuals. Anytime you want to talk toolkits, I’d be happy to! I agree with above posts—the table of contents is so helpful! It gives direction and a starting place. It can be intimidating to get started because there are so many possibilities, so we don’t do anything. Just having a simple, clear direction can make all the difference. Thanks Anna! Thanks Barb! I should certainly show it to my contractor! I love the idea of using the TOC as a starting point, then collecting around that. Thanks Christy! 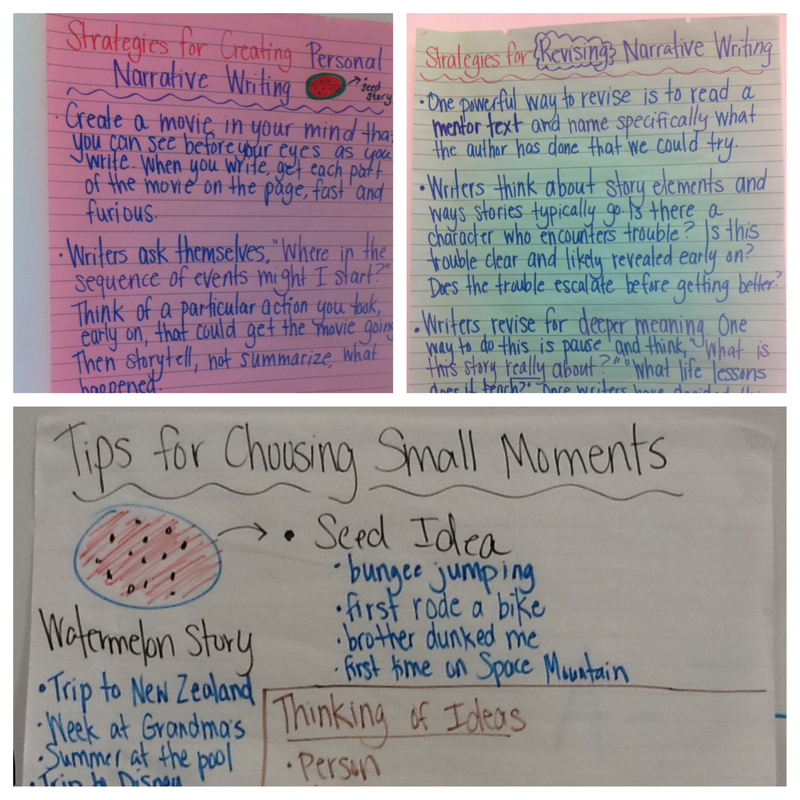 I got a lot of inspiration from seeing your toolkits this summer at the TCRWP Writing Institutes. Terrific post! The sample table of contents is exactly what I needed to help me get started on my own toolkit. Also love the idea of taking pics of helpful charts and printing off for individual student reference. I have now started thinking of the toolkit metaphor for other aspects of my life (my parenting toolkit, my interview toolkit, etc). Hope your contractor gets a chance to read this piece. My pleasure Tara – I covet great toolkits as well and have it as a goal for myself this year to really fine-tune my resources. I know finding the time to do it is hard, but of course so worth it in the end! Love this! I had seen (and coveted) some of the staff developers’ tool kits at the Summer Institute, and now I have a structure to work with. Thank you, Anna.